Superstorm Sandy roared into the nation’s most populous metropolitan area six years ago Monday. When it was all over, the meteorological monster created by a former hurricane merging with other weather systems had left at least 182 people dead from the Caribbean to the Northeast and a trail of tens of billions of dollars in damage. Disaster struck in the dark of night in Belle Harbor, and residents knew they couldn’t wait for aid. 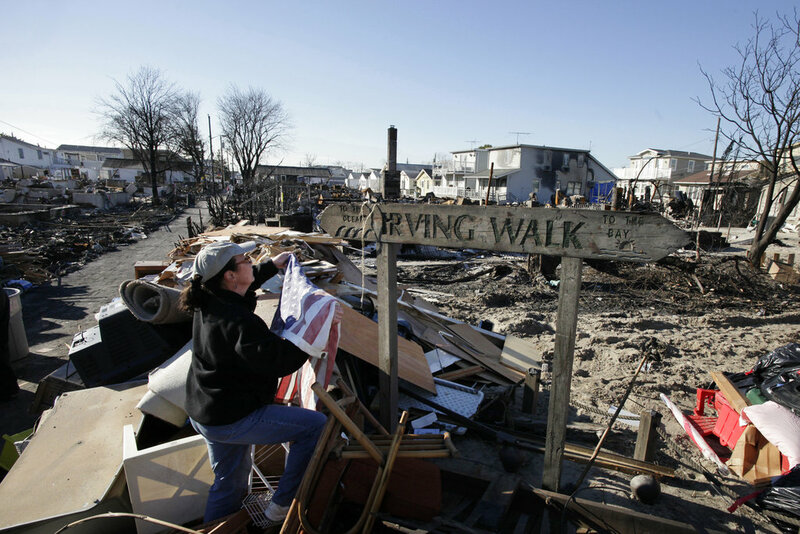 Superstorm Sandy’s surge swamped the community, which sits on New York City’s narrow Rockaway peninsula, and an electrical fire broke out and spread to over a dozen homes. There was no way for firetrucks to get to the area, where many people hadn’t heeded evacuation orders. But the community’s cohesion survived, says Tommy Woods, who used his surfboard and a kayak to rescue his family and over 25 neighbors as his own home burned. Woods, a fire lieutenant, was awarded a medal for his off-duty actions that night. Despite Belle Harbor’s ordeal, he didn’t hesitate to rebuild and return. “The people are wonderful,” he explains. Feeling he wasn’t getting accurate information, Kasimos started a Facebook group called Stop FEMA Now to share information on rebuilding rules. Soon, several hundred people were attending meetings of the group, which now counts 50,000 members in 30 states. Kasimos, meanwhile, did raise his home — so high that he installed an elevator to give visitors’ knees a break from the steep staircases. Lance Svendsen was ready to run his first marathon, in memory of an uncle who’d been a fan. On Facebook, Svendsen invited other runners to join their make-your-own marathon — 26.2 miles’ worth of loops around Central Park — and bring donations for Sandy relief. He’s president of the RunAnyway Foundation, which raises money through charity runs, and draws on his running stamina to carry sick children to hospitals from remote Guatemalan mountain villages. And after his first official marathon turned into horror in Boston in 2013 — he was a block away from the finish-line bombing that killed three people — he started writing a book about running’s role in his life. He aims to publish it in December. These days, the Ripkes — she’s a hospital lab technician, he’s a postal worker — relax in the expanded living room they built in place of the garage at their home in Selden. Former New Jersey Gov. Chris Christie told Jim Keady to “sit down and shut up” about Sandy recovery. Four years later, Keady is still standing, and still talking. “Because I had the truth on my side, and I wasn’t going to let him bully me, he blew a gasket,” said Keady, a Democrat who owns a tavern in Waretown. Christie remains proud of his Sandy recovery work, and spokeswoman Megan Fielder said this week that “Mr. Keady is still today what he was that day in Belmar: a know-nothing.” She added that “voters have confirmed that” in Keady’s unsuccessful bids for the Asbury Park City Council, the state Assembly and Democratic nominations for Congress during the last five years. Two hundred miles (320 kilometers) away in suburban Baltimore, Regina Shannon Bodnar saw Associated Press photographer Frank Franklin II’s photo online and knew at once: The house that had been in her family since 1929 was gone. Today, the “Breezy Point Madonna” stands outside nearby St. Edmund Catholic Church. “She’s a reflection of Breezy Point … how faith-filled it is, how family-oriented it is,” says Bodnar, who runs a Maryland hospice service and happens to be a certified barbecue judge. Friends asked whether Bodnar would take the statue. She didn’t even consider it.